Every week my little brother gets a kick out of seeing if he has made Friday’s Funny Facebook Quotes. Sometimes he has some pretty funny things to say and sometimes he reminds me of when he was a kid… he just thinks he is funny. Nonetheless, I love him and I am pretty happy to have a fun little brother and before any of my other siblings get mad, I love you all too. We had some pretty fun adventures growing up. Our mom was notorious for embarrassing us in public. Today we laugh about it but back then we would just hide. 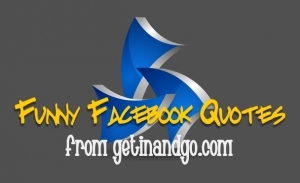 Enjoy this week’s Funny Facebook Quotes and share them with your loved ones. DON’T FORGET – From March 31 until April 2, the internet will be slowed down for cleaning out the “electronic flotsam and jetsam” in the network. Dead email, inactive ftp and http sites will be purged. The cleaning will be done by “five very powerful Japanese multi-lingual internet-crawling robots around the world.” According to the Global Interconnected Network Maintenance Staff – GINMS – “Your computers might seem slower but other than this, you should not experience any problems.” During this same twenty-four hour period, all worldwide telephone systems will be cleaned of wrong numbers. Comment: I thought you were serious! I guess you can “talk the talk!” You are hilarious! Is focusing on the positives in life…I am glad I have a job to hate, a husband who makes me nuts, a daughter who is smarter than me, a car that breaks down….and so on. I certainly wouldn’t want to be without the things in my life that make it interesting. Can’t get enough of Dragon Age: Origins. How quickly one becomes a gamer nerd. Says it’s so cold that there were penguins in my yard, until the polar bear chased them off! Wow!! Busy busy week…so much going on its insane!! I’m going to be one busy little girl until Sunday night! Boy how I can’t wait for it to come!! Reminder to self – you are in the hospitality industry, not the hostility industry. Some guests can really push your buttons! Wow! I love that I am married and don’t have to date crappy guys! Became a fan of I hate the effin’ Wii! I want to jump on it, rip out its insides, blend it up in the blender, start it on fire then flush it down the toilet….. But then I’d be desperately shopping for a new one tomorrow when I can no longer take the sobbing! *surprisingly I couldn’t find this fan page and I’m too annoyed to start my own. Would rather drink gasoline than hear about Tiger Woods’ personal life anymore. Shut up already!! Okay, I admit it! I am a FARMVILLE ADDICT…..I need weathered boards……NOW! I am so ready to get my knit on! Who wants a sweater? Two things I posted made the list, but I can’t take credit for them. I was quoting other people.